There are numerous Albert Einstein quotes that have application in today's real estate market, you just have to be smart enough to understand them :). Recognized as one of the smartest humans ever, Dr. Einstein was often quoted on matters beyond his E=MC2 equation. I believe that the health of today's real estate market is not nearly as warm and wonderful as many are reporting, so today we'll take a look at how some of my favorite Albert Einstein quotes apply to the real estate market going into 2013. We learned a lot from these other "famous people's quotes," but now I believe the market requires us to now turn to a genius for guidance. Today's political climate requires our "leaders" to always seek the quick fix, with no consideration given to the long-term ramifications of poorly thought-out economic fixes that are being used to solve today's economic problems. 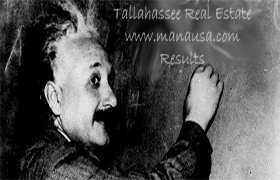 I hope you enjoyed the application of Albert Einstein quotes to today's real estate market conditions, if you know of another great historical figure that could inspire us, just comment below and we'll look to add his or her thoughts in the future. I really doubt Mr. Einstein would have supported any of your extrapolations of his words. "I am convinced there is only one way to eliminate (the) grave evils (of capitalism), namely through the establishment of a socialist economy, accompanied by an educational system which would be oriented toward social goals. In such an economy, the means of production are owned by society itself and are utilized in a planned fashion. A planned economy, which adjusts production to the needs of the community, would distribute the work to be done among all those able to work and would guarantee a livelihood to every man, woman, and child. The education of the individual, in addition to promoting his own innate abilities, would attempt to develop in him a sense of responsibility for his fellow-men in place of the glorification of power and success in our present society." Sure, based upon what he knew then Seth. But if we let him see the world today, after the fall of communism, I suspect he would apply the scientific method and change his thinking on the reality of humans coexisting in a socialist environment.